What is Let's Go Taxi? 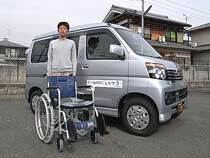 Let's Go Taxi is the wheelchair accessible taxi owned and driven by Akio Nakata. Based in Kyoto, one of the most popular tourist city of Japan, it provides a secure and reliable transportation for handicapped travelers from all over the world. The driver who is also a licensed tour guide will help you to plan your tour, visit sightseeing spots, pushing your wheelchair, and guide you around the spot. Who can use Let's Go Taxi? 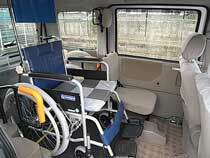 Let's Go taxi is supposed to provide its service for people with injury, illness, and disabilities. Whether a wheelchair is used or not, people with mobility problem can use my service. The van I use is Atray from Daihatsu. A Wheelchair user can access from the rear ramp, and the other two passengers have seats at one next to the wheelchair and the other in front. It is a small car with 660 cc engine, so not very good for driving on the highway to the airport for example, but best for driving in the narrow alleys in Kyoto city. 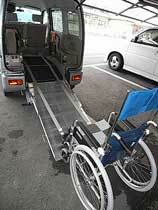 The wheelchair shown in the picture is available for your temporary use. 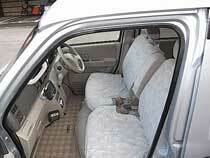 The size of wheelchair which the car can accommodate is shown below. 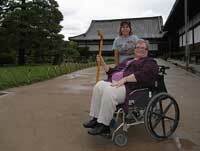 Most wheelchairs are within that size, although a height might be close. There is no additional charge for the assistance you need out of the car. If you travel for sightseeing, the meter starts when the car starts and stops when arriving at a site you visit. Akio Nakata is the manager and a driver of the Let's Go Taxi. I started the Let's Go taxi service on February 2011 at the age of 36. Before that, I worked at a senior care center for one year and drove a taxi at a taxi company for the following two years. So I was trained as a caregiver and a professional driver, also I have an experience of guiding sightseeing tours in Kyoto and Osaka for almost 100 times. The East city is the most popular tourist destination and my taxi is especially helpful to get to Kiyomizudera because it is located on a steep hill. If you have two days in Kyoto, these are places you should visit on the second day. Please use the form below to contact me for booking or other inquiries.